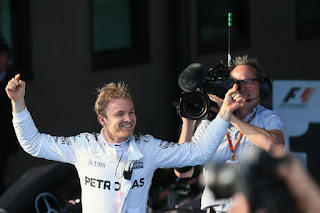 Here is my latest Motor Verso race review, this time for the Bahrain Grand Prix just passed. Just like in Australia, wrangles off-track threatened to dominate the Sakhir weekend. Just like in Australia, the excruciating qualifying system was used. Just like in Australia too through, the race despite everything turned out to be a diverting one. And just like in Australia, everything's coming up Rosberg. Still.